Many corporate leaders seldom understand how to combine analytical tools such as RFM, lifetime value, and customer segmentation to maximize the effectiveness of their marketing and sales effort. Too often, the costs of acquiring a customer are not compared with their follow-up purchases. Sales of support items, such as parts, are sometimes not considered. Follow-up marketing expenses are ignored or considered as the same percentage of sales for all customers and prospects. Customer research, normally done through focus groups and surveys, is seldom used to improve a company’s ability to quantify information already available. How likely are they to buy or re-buy from you? If they buy from you, how much are they likely to buy? If they have a replacement cycle, how long is it? Of what they buy from you, how profitable are the sales likely to be? How much is it likely to cost to sell to this account? Rarely are the answers to these questions found by simply overlaying existing data and comparing it to sales data, especially when new unit and service support data is held separately. For example, it can be found by overlaying data that one company operates mines, and another bottles spring water. While you can quantify the differences in sales by SIC code, what you cannot easily determine is what share of the mining market vs. bottling market you control. Perhaps mining companies use your product almost exclusively, as it is well suited to their needs, while bottlers prefer a competitors product. Also, it may be that since mining operations are dusty and dirty, they purchase more replacement parts and have a shorter replacement cycle. Without doing research to quantify these differences, they will likely be ignored. Building a customer value index that takes the subtle difference between customers into account can improve a company’s ability to target and segment it’s customer base for maximum profitability. Lifetime value tends to be based on source codes (why customers entered the database), while the customer value index is based on what type of customers they are. Lifetime value tends to be based on a single department, single computer system tracked selling process, while the customer value index tends to be based on all purchases a customer makes from both the company and its competitors. Lifetime value tends to be based only on data within the company, while the customer value index also requires secondary (industry or consumer) data that must be quantified through research. A customer value index can show both what customers do buy, and what they could buy, based on their likely purchase levels in the product categories being evaluated. As a result, it is both a customer and prospect segmentation tool. Determining the level of product consumed often requires research, to quantify information already available about customers and prospects. While it might make for better data, it is usually impractical to survey customers and prospects on a regular basis to gather the marketing information desired. Instead, it is typically more efficient to determine which of the variables about each customer or prospect relates most directly to sales and product usage. This can be done by surveying only a portion of the potential customer universe. It is through research applied to existing information that variables such as SIC code or age and income can be quantified into actual scores. For example, in two different SIC codes, companies of equal size may purchase from you, on average, an equal amount. However, through research it can be determined that one SIC code uses five times more of the product than the other, but it is penetrated more heavily by competitors. Research makes it possible to quantify the difference between these groups, and target large potential buyers who otherwise may have been ignored. In another example, a construction company that builds commercial buildings may use its equipment more heavily than a construction company that builds residential homes. As a result, it may have an average of 75% more in replacement parts purchases after the initial sale. The list goes on, but the point is that secondary information, by itself, does not always answer the questions database marketers have when targeting segmenting customers and prospects. Once the information is gathered, and assumptions checked for reasonableness, all of the components can be gathered into a single index, made up of several parts. Normally, two scores are created. First, the actual score, based on past purchases, for existing customers. Second, the potential score for both customers and prospects, based on all the information gathered. It is important to note that the research information is not directly included in each customer or prospect score. Rather, the research is applied to the secondary information. In the previous example where in one SIC code companies consumed five times more than another, the potential sales component of the index would be five times higher for the former SIC code than the latter. Note that the resulting score is actual expected dollars. For an added measure of accuracy, expected marketing expenses can be subtracted from the result. Time value of money can be added to represent the greater value today of more rapid cash flows. Rather than having to convert a meaningless number, actual customer and market potential value can be compared to determine marketing priority. An important part of the success of the customer value index is that it be as simple and understandable as possible. By keeping each component score simple, managers can better understand and use the index. Also, each component can be used differently, depending on the promotional effort. Salespeople may want to specifically target high potential new unit buyers, while service may target heavy parts buyers. Customers in a particular industry may be targeted with a specific campaign. Targeting customers and prospects based on a customer value index can help target not only the offer but also the message. Basing differences on the customers, not just the offers, will provide better a understanding of how offers should be positioned, and which features and benefits are most valued by different market segments. As knowledge is gained through the use of the customer value index, the accuracy of the component scores can be improved or simply adjusted for a changing marketplace. The score is not an end in itself, but rather should be kept fresh through data updates and periodic research. 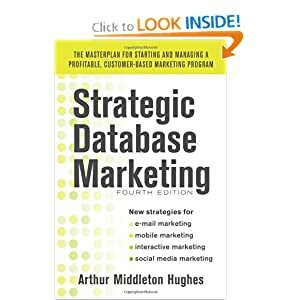 Armed with this knowledge, database marketers can re-direct sales and sales support efforts to the areas with the greatest long term potential. Product development will have a strong tool to find in which markets their products are perceived as weak and where they are perceived as strong, so products can be improved or modified for different types of usage. Corporate decision makers will have a quantifiable means to justify and measure marketing efforts. While building the index is an often arduous and complex task, once it is done it should appear as a simple, common-sense tool to the managers that rely upon it. It is important to have knowledgeable, experienced database marketers assist in the creation of a customer value index, and it is just as important to combine their knowledge with managers who understand the industry. Rather than being viewed as a computer modeling tool, creating the customer value index should be viewed as a process to build and use knowledge. A customer value index brings together and improves the tools at a database marketer’s disposal. Very different from a “black box” modeling routine, it supplements, rather than replaces, the marketer’s knowledge and becomes a part of marketing strategy.